It has been nearly 3 years since Outerlink launched IRIS, the all-encompassing tool for voice, video, flight data recording and high performance satcom communications. Since its inception, the team behind IRIS has continued to push the technology forward and reimagine the way operators are managing, overseeing and monitoring their fleet. In 2017, operators installed the solution on more than 100 aircraft and more operators are joining the Outerlink family. IRIS’ Push-To-Talk (PTT) Voice over IP (VoIP) radio has proven reliable and clear. Further still, IRIS has proven significant financial savings by enabling many operators to eliminate their legacy VHF networks. 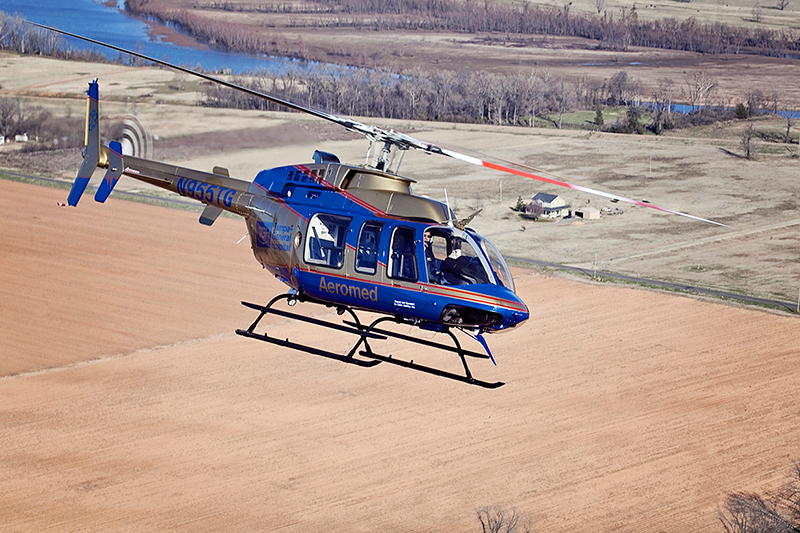 Survival Flight, based in Mesa, Arizona and Batesville, Arkansas, are in the process of converting their fleet of Bell 206L and 407 air medical helicopters to the IRIS solution. They are also taking full advantage of the system’s in-cabin WiFi and broadband connectivity with the ability to push live EKG data to receiving hospitals in less than 12 seconds, significantly changing the way healthcare professionals practice medicine. The feature is part of a new integration with the Zoll X monitor and allows professionals to be fully engaged in patient care before the helicopter ever touches down. The U.S. Department of Agriculture has also selected the Outerlink tracking solution to equip their fleet of airplanes and helicopters. The solid performance of the Outerlink product and the ability to provide automatic activated Mayday alerts were key factors in the selection of Outerlink. The IRIS system is compatible with a full range of helicopters, from older analog models to the newest on the market, allowing operators with a mixed fleet to still reap the benefits of this technology. IRIS currently holds a variety of certifications from the FAA, EASA and Transport Canada for numerous aircraft including the S92, EC135, EC145e, B206L, B407 and more. Phoenix Heli-Flight of Ft. McMurray, Alberta, Canada is upgrading their fleet to the IRIS solution and will collaborate with Outerlink to develop additional Supplemental Type Certificates (STCs) for analog and digital AS350, EC120 and EC130 helicopters. With its open architecture and push-to-talk solution, IRIS gives operators the latest communication technology with just one installation. The user-friendly software suite accompanying IRIS provides the only integrated time-synced playback of audio, video and flight data, giving operators insight into how their fleet is being flown. Due to its software-based configuration, IRIS is protected against obsolescence. The adaptability is another cost saving factor for operators to consider when choosing a communication and data-monitoring tool. In a challenging market, Outerlink is providing a solution that not only promotes safer operations, but also immediate cost savings and reduced downtime. For more information, visit Outerlink on the Metro Aviation booth at HELI-EXPO in Las Vegas, Booth N2207.